a versatile tool that functions well. I’ve wanted a portable BS since I built my timber frame house 20 years ago. But they were expensive and 4 inches was insufficient capacity for most of my timbers. (It’s interesting to note that since that time, Mafell and others now make 12” capacity portable BSs and they only run $4-6K :^o ). 1. With the ubiquitous HF 20% off coupon, it cost me $60! 2. It cuts metal like butter. So far I’ve used it on aluminum & steel bar stock (up to 1”x6”), hardened bolts, black iron pipe…. it chews it up. 2. It’s light and fairly handy. 3. It stows away on a shelf under my bench. 4. The variable speed works well and is an important feature for starting your cuts in a nice controlled manner. 5. It came with a good blade. 7. It uses the same length blade as the name brand portable BSs (Milwaukee, Makita, Dewalt) so I can get replacement blades of various tpi at the BORG. Did I mention it cuts metal like butter!! I’ve used stationary metal cutting horizontal band saws (small and medium sized units) in the past and this little HF portable is no slouch. What I don’t like about this saw. 1. It’s VERY loud. So I always use ear muffs when running it. For $60, this saw is a winner! After using it for several months now, I’d readily pay twice that. I especially wish I had this little saw when I cut the J-bolts that secure the sill to the foundation. After seeing how handy these saws are, I wish I could justify paying $400+ for a name brand 18 v LI cordless. But HF got me in the game at a price I could afford and I’m very happy to retire my hack saw. An final word about my experience with Harbor Freight. I’ve been an infrequent customer for some 20 years. In general, I save my pennies and buy the best quality tool that I can afford and have all the premium “domestic” brands in my shop. I can’t afford Festool. But neither can I afford a tool that doesn’t work well, or worse yet, is dangerous (I had a China made box wrench brake and almost putting my eye out once). My intent is not to facilitate yet another HF bashing session, but rather to share my experience with this specific tool. Thank you for the review. That product at that price represents value to you. And that’s what it’s all about. Just yesterday I was using again my HF Horizontal/Vertical Metal Cutting Band Saw and I was thinking what a good tool and a time saver it has been since I have it. Thanks Matt, I’ve looked at this a couple of times. This is helpful. Bert…. I’ve used that saw (several companies sell the same saw, but with different paint color) and have considered buying it in the past. I just don’t have the space in my shop, and putting it in the barn is too inconvenient. They’ve gone up in price on those as well, as you used to be able to find them for under $200 (sometimes well under). When I do not use it, mine is away under a bench. I saw a guy make a bracket to mount this portable BS in a vise that I’d like to copy…. Easier to use for small parts. I’m a big fan of Allan Little. Here’s a video of his custom portable-to-stationery project. I personally have had pretty good luck with my large tools from harbor freight. 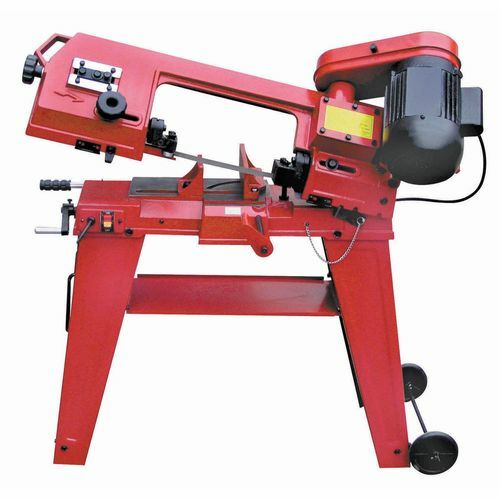 I have the 2hp dust vac, 47” lathe, 5ft tall drill press, bench top mortiser, 8” bench grinder, 4.5” hand grinder, disk/belt sander bench top tool, and other miscellaneous hand tools and have a fairly good experience with most. Some have some minor problems that can be overcome just by ignoring it , some are a little louder than they probably should be and a couple have been outright junk. Many times there is a tweak here or there to be made to make it better. All in all I have saved more money than I have wasted in my opinion. Its a really great place to buy tools you know you are going to trash, drill bits, smaller allen wrenches, sand paper, latex gloves, paint brushes, etc. Thanks for the review of another good harbor freight deal. I think I may have stated in another post, I have been told that there are a couple of tools makers out there that the only difference between them and harbor freight was which direction they went for paint and labels at the end of the line. The two I remember were shopfox and grizzly but I had also heard jet.